When Richard L. Lobb heard that Walt Disney Co.’s ABC television was planning a disaster thriller, “Fatal Contact: Bird Flu in America,” for next week’s “sweeps week,” he went into crisis mode. Mr. Lobb, spokesman for the National Chicken Council, which represents nearly all of the chicken producers and processors in the U.S., wrote to the network demanding that it change the word “bird” to “pandemic” in the title. He also insisted that the movie, to be aired Tuesday, carry disclaimers such as “This movie is fiction” and “Eating poultry is safe.” Finally, he posted a video on his trade group’s Web site featuring healthy-looking farm chickens and developed talking points stressing that the avian flu can’t be contracted by eating fully cooked chickens. Hope Hartman, a spokeswoman for ABC television, says the network has acted “very responsibly.” Even before Mr. Lobb’s letter, she says, ABC decided to show messages at the beginning of the movie saying it was fiction and at the end directing viewers to a government Web site on pandemic flu. But there are no plans to change the title, as Mr. Lobb would like, and “there are not any discussions about chickens” in the movie, Ms. Hartman says. Mr. Lobb has been talking up chickens for years. 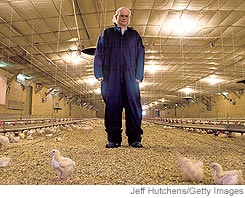 In 1998, he was hired by the National Broiler Council, which a year later changed its name to the National Chicken Council. Before that, he handled the council’s account while at the public-relations firm Fleishman-Hillard Inc., where he also represented such industries as plastics, home building and coal mining. “I have been very fortunate in my public-relations career — I never had to defend the indefensible,” says Mr. Lobb, whose office is decorated with stuffed-chicken animals, a Frank Perdue bobblehead doll and a hen that lays bubblegum eggs. The avian-flu threat poses Mr. Lobb’s biggest challenge so far. For the U.S. chicken industry, with about $38 billion in annual retail sales, maintaining public confidence is crucial. Last year, the average U.S. consumer gobbled down nearly 90 pounds of chicken, compared with less than 24 pounds in 1960. In a recent survey of 1,043 adults by the Harvard School of Public Health, 46% of chicken eaters said they would stop eating chicken and 25% said they would eat less if avian flu shows up in the U.S. World-wide, the virus has killed more than 110 people, most of whom came into close contact with poultry. For now, the disease doesn’t seem to have the ability to be easily passed from one human to another. But if it mutates and triggers a pandemic — the premise of the ABC movie — the government says it could kill as many as two million Americans. To ease public anxiety, Mr. Lobb and his helpers in the industry scour the media for more-upbeat reports. He recently circulated comments by Anthony Fauci, director of the National Institute of Allergy and Infectious Diseases, who said that “it is impossible to predict” whether the bird-flu virus will trigger a pandemic. Mr. Lobb also called attention to comments by Agriculture Secretary Mike Johanns who noted that the industry has taken extra steps to protect chickens and that cooking the birds at 165 degrees kills the virus. To show off the plumped-up “bio-security” steps taken by many producers, Mr. Lobb recently conducted a tour of the Valley Pike Farm in Broadway, Va., an independent family farm under contract with Pilgrim’s Pride Corp. to produce 600,000 chickens a year. 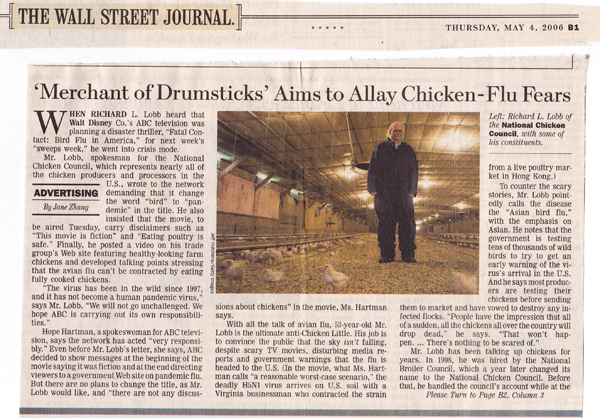 Which, of course, is exactly the message Mr. Lobb, who refers to bird flu as “AI” — for avian influenza — is pushing. As for the ABC movie, he’s not planning on watching; instead, he’ll be attending a Boy Scouts meeting. He hopes TV watchers will be lured by a competing show. “The other AI [“American Idol”] may come in handy,” he says.